Ian Thorpe will be unable to defend his Olympic 400m freestyle title in Athens, having been disqualified for a false start in the heats of that event at the Australian Olympic Trials in Sydney this morning. 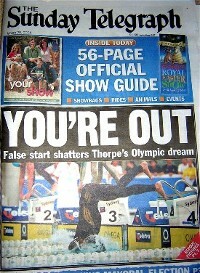 In the first sensation on the opening day of the championships, the Thorpedo appeared to lose his balance on the blocks and tumbled unceremoniously into the pool. He immediately lodged a protest, claiming that he had heard a noise that had caused the false start, but that was rejected by poolside officials. A subsequent appeal was also rejected following a 45 minute hearing. Barring intervention from the IOC to allow Thorpe to defend his title, as has been done in athletics in the past, his participation in Athens would appear to now be limited to the 100 and 200m freestyle events and relays. Fellow Australian Grant Hackett now assumes the mantle of favourite for the 400m Olympic crown, assuming no slip ups in tonight’s final.